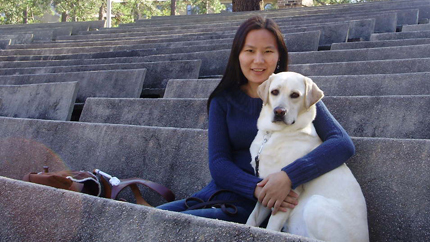 Fulbright Foreign Student alumna Uyanga Erdenebold with her seeing-eye dog, Gladys. As a student in Mongolia, Uyanga Erdenbold did not have the same opportunity to read books as her fellow students did until she reached college. This is because Uyanga was diagnosed with retinoid dispegmentosa when she was a child, and she lost her sight over time. Her schools and local libraries did not offer books in Braille or audio format, so Uyanga had to rely on others to read to her. Despite these obstacles, she graduated from a well-known university in Mongolia with top honors. Most of the challenges Uyanga faced in her education related to reading and finding information. Confronted daily with the lack of availability of reading material for blind people, Uyanga developed a special interest in the ability of libraries to serve their local communities. This motivation led her to apply for the Fulbright Foreign Student Program. In 2007, Uyanga was awarded a Fulbright grant to study at Louisiana State University’s School of Library and Information Science in Baton Rouge, where she had access to many new resources. “I received audio books from the U.S. Library of Congress’ National Library Services for the Blind and Physically Handicapped. This service [brought] the world of literature to me. I [enjoyed] it so much that sometimes I [stayed] up late at night to catch up with my school work,” Uyanga said. For Uyanga, however, the most important step she would take toward independence would not be found in a book but instead through a Labrador dog named Gladys. Gladys is the guide dog that Uyanga received during her time in Louisiana. The two trained together with an instructor and soon formed an unbreakable bond of trust. From there, Uyanga began to experience independence as never before. “Gladys not only guides me through physical obstacles, but she also guides me through the emotional barriers and difficulties of life. I cannot imagine how it would be without her. She is as much a part of me as my legs or my hands,” Uyanga said. It is no surprise, then, that after receiving her Masters in Library and Information Science, Uyanga took Gladys back home to Mongolia with her. There, Gladys has become a superstar in her own right as the first trained seeing-eye dog in Mongolia. Life for Gladys is very different in Mongolia, where there are no guide dogs or instructors. Of particular difficulty, there are no laws regulating the rights of guide dogs and users to have access to public places, such as shops, schools, hospitals, restaurants, or public transportation. “At first, nobody had any idea what kind of a dog she was. They all thought I was a weird person who put a ‘handle’ on my dog for attention. [Women and children] would scream and jump away when they saw Gladys walking near them or approaching them. They would leave the elevator if we got on with them,” Uyanga said. It was through Uyanga and her success, however, that Gladys began to win over public opinion. Following her grant, Uyanga obtained a position working for the U.S. Embassy in Ulaanbaatar - the sort of prestigious position that, according to Uyanga, is typically very difficult for a blind person to attain in Mongolia. As a result, she started receiving unsolicited requests for TV and newspaper interviews. It was through these public appearances that Mongolians began to fall in love with Gladys. Uyanga will continue to move forward to educate the Mongolian public about the usefulness and companionship of service animals. She cannot forget how much her experience in the United States has changed her. Watch Uyanga’s TedX presentation on understanding and acceptance in a challenging world from December 2013.